Joey “The Weasel” Frizzone has been deep undercover with one of the country’s largest organized crime families and the time has come for him to testify against them. The trial isn’t for a couple of weeks, and the feds need him to lay low, so they hide him in a place no one would ever think to look—a sleepy little town in Florida called Whispering Bay. Lucy McGuffin bakes the best muffins in town. She’s also a human lie detector, a talent that hasn’t always been easy to live with, because, c’mon, how many times can a girl hear “It’s me, not you,” and keep a straight face? Lucy’s ability to sniff out a lie has given her a reputation for solving crime, so when an attempt is made on Joey’s life, local police officer, Travis Fontaine reluctantly seeks Lucy’s help. But Lucy and Travis have a wobbly relationship. The arrogant cop thinks he’s God’s gift to womankind and Lucy isn’t about to become President of his fan club. Someone in the FBI must have a big mouth because soon there are enough hitmen in town to make Whispering Bay look like a reunion site for The Sopranos. Then someone starts whacking the hitmen. As the body count begins to rise, Lucy realizes she has to step up to the plate. 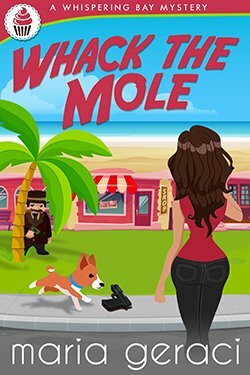 Travis needs Joey to stay alive long enough to testify, and Lucy wants her quaint little town back, minus the mobsters. With the help of her best friend, Will, and her rescue dog, Paco, Lucy and Travis set out to discover who’s behind all the hits because if they don’t, Whispering Bay may never be the same again. Ba-da-Bing. Ba-da-Boom.